The Story of Step Afrika! Founded in 1994 by C. Brian Williams, Step Afrika! is the first professional company dedicated to the tradition of stepping. Under Mr. Williams’ leadership, stepping has evolved into one of America’s cultural exports, touring more than 70 countries across the globe. Step Afrika! 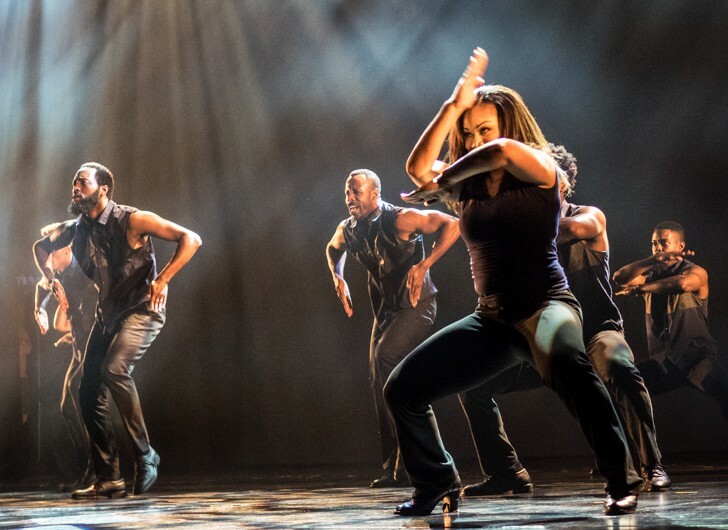 now ranks as one of the top ten African-American dance companies in the United States. Step Afrika! blends percussive dance styles practiced by historically African American fraternities and sororities; traditional West and Southern African dances; and an array of contemporary dance and art forms into a cohesive, compelling artistic experience. Performances are much more than dance shows; they integrate songs, storytelling, humor and audience participation. The blend of technique, agility, and pure energy makes each performance unique and leaves the audience with their hearts pounding. Step Afrika! promotes stepping as an educational tool for young people, focusing on teamwork, academic achievement and cross-cultural understanding. The Company reaches tens of thousands of Americans each year through a 50-city tour of colleges and theatres and performs globally as Washington, DC’s one and only Cultural Ambassador. Step Afrika! has earned Mayor’s Arts Awards for Outstanding Contribution to Arts Education (2005); Innovation in the Arts (2008); and Excellence in an Artistic Discipline (2012); and most recently performed at the White House for President Barack Obama and the First Lady. Step Afrika! is featured prominently at the Smithsonian’s new National Museum of African-American History & Culture with the world’s first stepping interactive. In 2017, Step Afrika! made its Off-Broadway debut with the critically-acclaimed production, The Migration: Reflections on Jacob Lawrence. To learn more, visit www.stepafrika.org. Please email aborman@bardavon.org or call Adelina Borman at 845-473-5288 ext. 106 with your credit card information. All patrons regardless of age must purchase admission. You will receive confirmation of your purchase by email. An INVOICE/CONFIRMATION will be sent by email confirming your order - please adhere to the payment guidelines and due dates. Changes to the number reserved or cancellation must be made in writing 45 days prior to the event. Payment is due 30 days prior to the event. No refunds or exchanges will be made after the 30 day deadline. The teacher or individual making the reservation is the contact person and is responsible for assuring that payment is made by the deadline. Buses will unload and load in the front of the theater.